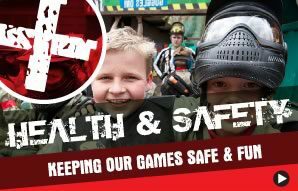 Campaign Paintball & Laser Park was founded in 1987 and has built an excellent reputation for quality entertainment and regard for the health and safety of participants. Campaign is a member of the United Kingdom Paintball Sports Federation, the sports Governing body of which we have a 5 star rating. 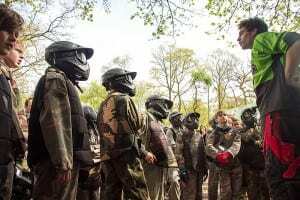 Director Niall Squire was an Executive Committee Member of the federation for many years and fellow Directors Jim Sennett and Lawrence Barwick have worked within the paintball industry for over 28 years. Campaign is situated in Old Lane, Cobham. It has large woodland playing areas which are free from potential hazards and clear of public rights of way. Centrally situated is the Safe Zone, this enclosed area is surrounded by 3 metre high paintball proof netting and paint markers are always kept outside this area, so participants can safely walk around within without wearing their safety equipment. Situated within the safe zone are the central administration office, Stores, First Aid, Toilets, changing and kitchen, where food is prepared in compliance with Environmental Health guidelines. Lazer Tag games take place completely separate from paintball areas. All games take place within daylight hours, and are marshalled by fully trained staff on a ratio of approximately one marshal to fifteen players. The marshals are clearly visible in site uniform and in contact with each other via handheld radio’s. At each event there is at least one marshal or manager with Red Cross/St Johns Ambulance First Aid Training. Prior to the commencement of games a comprehensive introduction and safety briefing is given to all participants. This includes instruction on the safe use of all equipment with important emphasis on eye and ear protection, (goggle cleaning & adjustment procedures etc.) the rules of the game, a description of the geography of the site and an introduction to the site staff. The equipment provided to participants is of the highest standards. All paintball players are given goggles with integral face, head & ear protection. All equipment is checked and serviced weekly. Our camouflaged combat suits come in all sizes and protect you and your clothes from the riggers of the game. Furthermore, they also come with a padded collar to protect the neck from stray paintball shots. All paintball markers are chronographed regularly and set at approximately 270 feet per second. The kinetic energy of the paintballs will not exceed 12 ft pounds. The contents of the paintballs are non- toxic, biodegradable and non-irritant. There is no requirement for goggles whilst playing Campaign Laser Tag as no projectile is actually fired. So contrary to the name, Laser taggers don’t actually fire a laser, but an infrared beam ( like a TV remote). This is completely safe and harmless to the eye. If you have any other concerns with regards safety, please do not hesitate to call us. A copy of our Employers/Public Liability Insurance Certificate and Risk Assessment is available for inspection on request.